Salt and Sanctuary, a PS4 and Vita title from the two-person powerhouse Ska Studios, will be hitting 2015 like a storm. From the same indie masterminds that brought us the Dishwasher titles, and one of my personal favorite 360 Arcade titles I MAED A GAM3 W1TH Z0MB1ES 1N IT!!!1. I got to mess around with a PS4 build at the show, as well as talk with the devs James and Michelle, and came away only wanting more. A nice vertical slice with several class options, the controls were easy to pick up, and soon I was carefully making my way through a castle tower of creatures and the undead. Magic is powerful, but you are defenseless while charging up an attack. While the controls are easy to understand, the gameplay is a blast to master. A mix of old-school influences like Metroid and Castlevania, and new influence from games like Dark Souls, enemies are quick to punish poorly-timed dodge rolls or a recovery frame too long. The boss of the area was a true test of skill, and after getting beat up on by him, I was quick to say “I got him this time” and speed my way back to his area. Luckily, recovering your resources (called “salts”) after death isn’t too difficult; you just have to do enough damage to the enemy that killed you before the bar on your screen hits zero. In some cases, this just means making up for a bad mistake made previously. In other cases, you’ll be slamming your head against a boss or difficult enemy repeatedly, until you learn to read tells and fight less carelessly. It’s sometimes brutal, but a fun experience that makes it feel like you’re constantly improving on learned skills. Combat is brutal and quick, and a missed roll means a swift death. Set on a strange island where the player character has washed ashore, players will be able to slay enemies, master multiple styles of combat and establish their creed. Creeds are a chosen religion reflected in each taken sanctuary, which serves as both a respawn point and a home base for NPCs and shopkeepers of your creed. Some creeds may benefit magic-based characters, while others might be better off pursuing a sect more suited to other styles of combat. Bosses are intimidating, fun to fight and each has their own unique aesthetic and attack patterns. 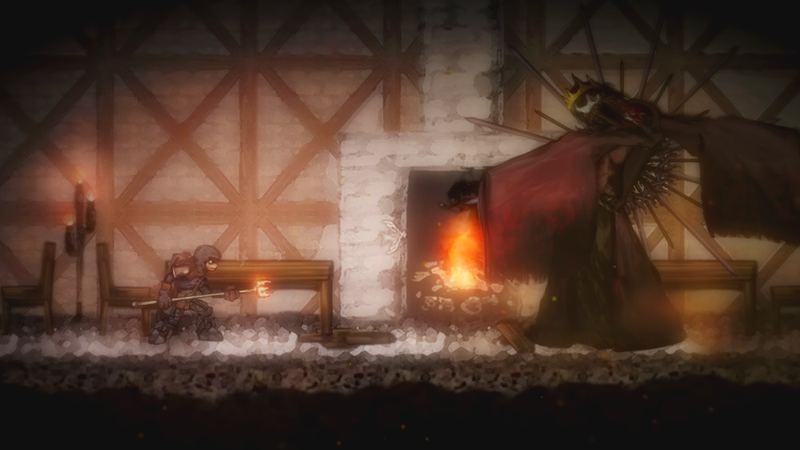 Salt and Sanctuary is set to arrive in 2015 for both PS4 and Vita.